The Tantalus Wall is second only to the Grand Wall for simple visual impact to the climber viewing the walls from below. The upper half of the wall is impressively shear with a dramatic roof guarding the upper headwall, the large trees along the clean cut rim of the cliff lend a sense of scale to the face. The climbers eyes can’t help but be drawn to the crazy, zig zagging dykes on the right side of the face. The first route to take advantage of these fortunate quirks of geology was Cerberus. 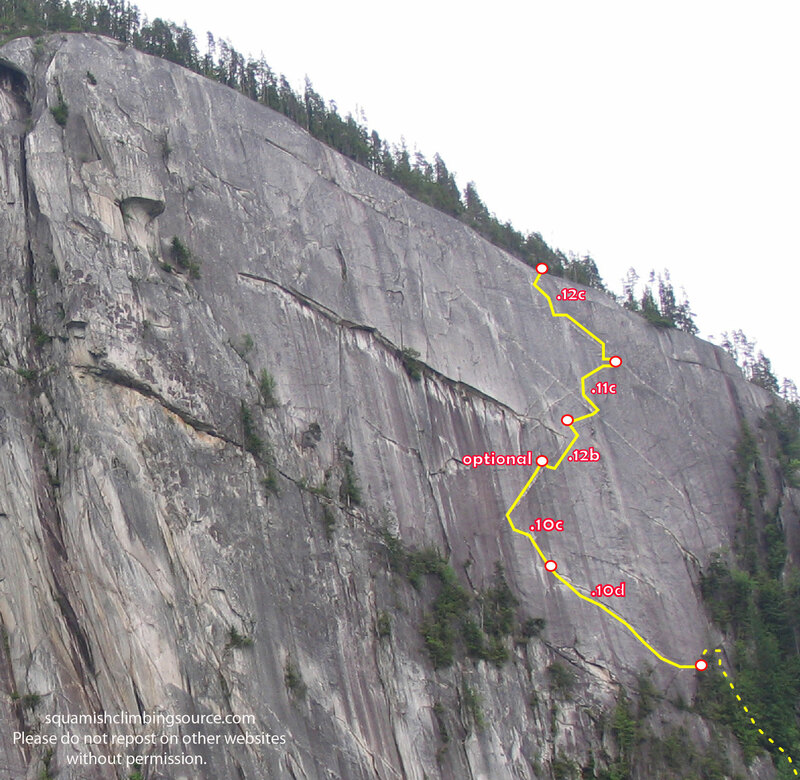 Established in 1976 by two of Squamish’s most visionary climbers. Darryl Hatten, who was the undisputed wall climbing master of the era and Eric Weinstein a visionary freeclimber who gave Squamish its first 5.12, Sentry Box, that same year. Cerberus, in Greek mythology, is a terrifying three headed dog that guards the gates of hell. 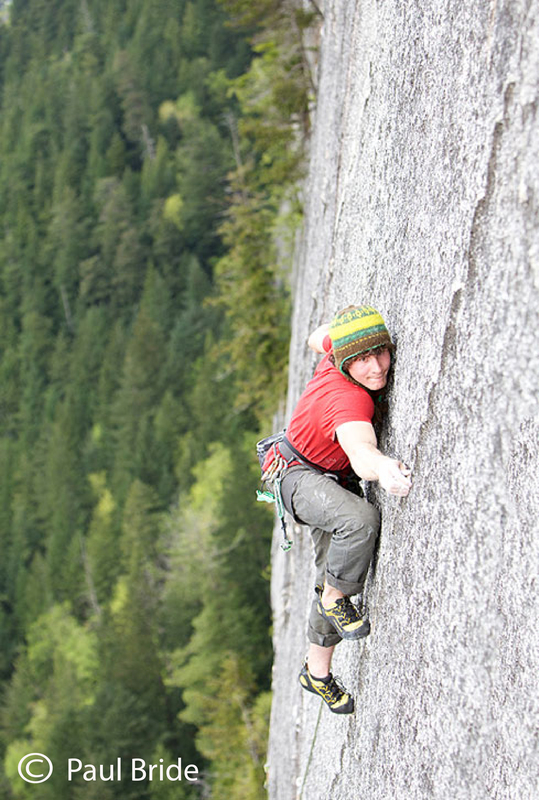 The upper three pitches of the rock climb, like its namesake were also terrifying, featuring expanding nailing, massive runouts on hooks (60+ feet), and bold freeclimbing. Cerberus saw very few repeats. 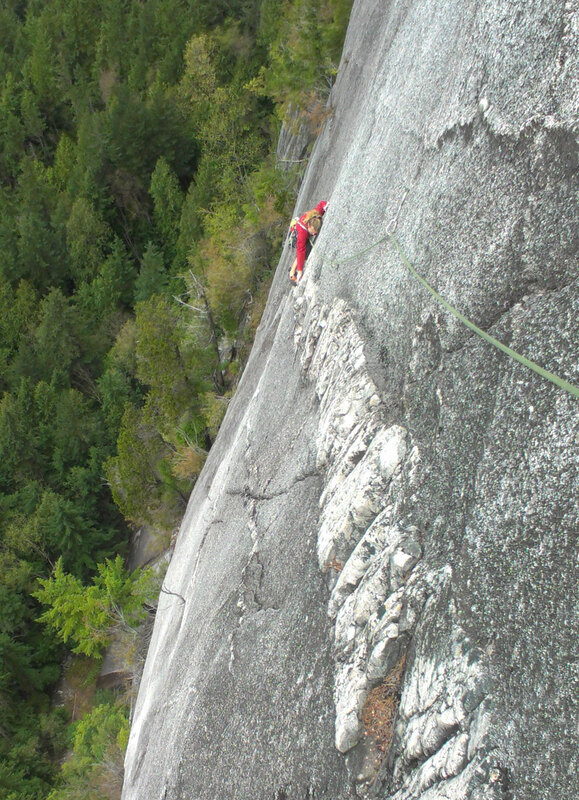 By the mid 80’s the Squamish free climbing revolution was in full swing and all the players new that Cerberus would yield an amazing free route. Not wanting to tarnish the climbs bold history Dean Hart and Randy Atkinson decided that adding bolts for freeclimbing would be acceptable if done on lead, and thought that wearing ridiculous, gaudy lycra tights might protect them from the beasts wrath. The tactic worked and Cerberus was transformed into a classic free route, although much more popular with the additional bolts, the expanding flakes still regularly scare the crap out of people. Dyke hooking, you really need to click on this. The large, empty section of wall between Cerberus and Wrist Twister is laced with the same sinuous, elegant dykes. Although this section of wall has been the source of much speculation, several sections of blankness and general apathy had kept it pristine. In the winter of 2013 Marc Andre Leclerc and Luke Neufeld began establishing what would become the Labyrinth. Whether they were trying to honor the history of this piece of wall or if they just thought it would be a wicked adventure, they decided to establish the line ground up. They endured several February hail storms, scary aid, and multiple whippers as the hooks blew, sometimes taking away positive crimps in the process. By late April the line was prepped and the free ascent shortly followed. The first ascentionists feel that although considerably harder, Labyrinth is easily as good as Cerberus. Recent repeat attempts confirm the routes outstanding character. The climb begins off of the ledge below the popular aid route ‘Wrist Twister’, approach via fixed lines in the South South Gully. 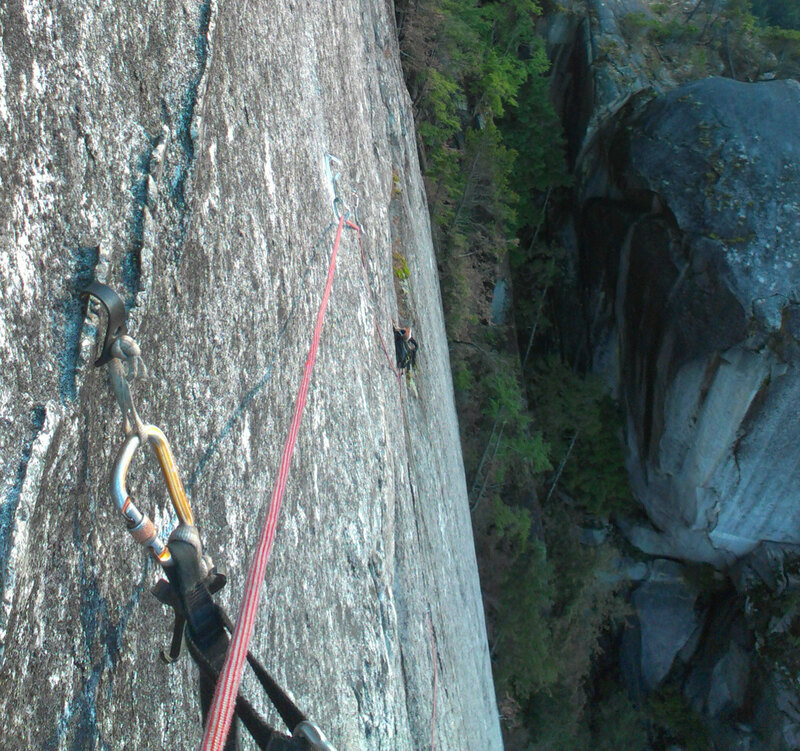 ‘Catharsis Crack’ From the ledge at the base of Wrist Twister, climb down and left 10ft (fixed line) to reach the start of a prominent dyke. Climb the lovely dyke to reach the left trending flake system, sustained underclinging leads to a surprise crux around half way. Continue up the flake system to a bolted belay, be wary of hollow rock nearing the end of the pitch. 5.10c/d. bolts + gear. Super fun. This pitch is an excellent alternate start to Cerberus. Face climb up and left along a dyke to join the awesome first pitch of ‘Cerberus’. After clipping the belay station on Cerberus, downclimb until possible to traverse right along a very thin dyke to the adjacent ledge. From here climb a RIGHTEOUS thinning dyke up and right to a belay on yet another dyke. 5.12b, a long pitch. Fully bolted and fairly sustained. Foot traverse right along the dyke then climb directly up the face, passing a hanging belay on ‘Wrist Twister’ to reach another right trending dyke that leads to a nice belay on a small ledge. 5.11c. Bolted. Nervously shuffle back left along the ledge, then make some easy face moves to reach the prominent dyke leading to the top of the wall. The dyke is balancy to begin and bouldery to finish. 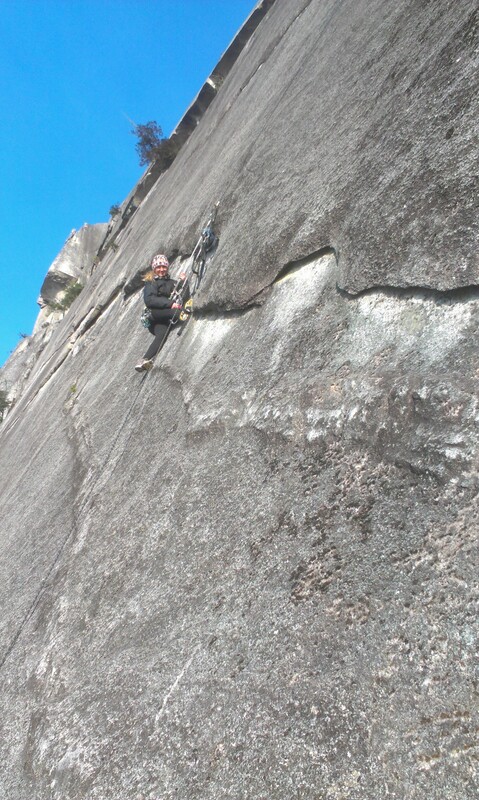 From the last bolt, climb a slab up and slightly right to a bolted belay. 5.12c. Bolted. Note -There is a sharp edge on this last pitch, use a sling on the 4th bolt! Pitch 2 joins the amazing pitch 1 dyke of Cerberus. Bring a few cams from tips (blue metolius) to hands (red or green BD camalot) and about 14 draws including a couple long runners.